If you turn up at your local blues jam toting a Travelcaster you’re going to be noticed. What would Leo have said? It’s a perfectly good, fully functioning full-scale entry-level Stratocaster-alike. The lack of body affects the playing feel (both strapped on and seated) and impacts on the sound. You’d be forgiven for thinking it was April, but, no - this Traveler Guitar Travelcaster Deluxe is not something conceived in Photoshop. 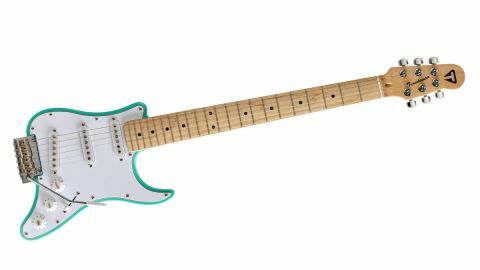 It’s a full scale (648mm/25.5-inch) electric solidbody, although, as you can see, the 44mm thick poplar body is, er, rather reduced following the outline of Fender’s classic Stratocaster scratchplate. And instead of the six-in-a-line headstock, we have a stubbier-looking three-a-side head, which helps to trim the length down to 33.75 inches - pretty much the equivalent of lopping the headstock off your Strat. The Travelcaster Deluxe is one of 30-something full-scale travel guitars offered by Traveler: “From the original Pro-Series model to the cutting edge EG-1 Custom, to the revolutionary Traveler Acoustic Series, our guitars have travelled all over the world, from a submarine deep in the Atlantic to the peak of Mount Everest,” we’re told. a short while later. The very futuristic electric Speedster soon followed (and still remains the best-selling model), while our Travelcaster Deluxe was launched in 2017. The Travelcaster Deluxe, with its vibrato, has a Strat-like array of single coils and controls. Aside from the light weight, the lack of body makes for an unusual playing experience both seated or strapped on (the latter not helped by the dished output jack on the back of the body). But aside from frets that lack a final polish, it plays, well, like an entry-level Strat and has sounds to match, albeit lacking a little sustain and, yes, body. There’s no shortage of down-sized travel guitars out there, or indeed unusual guitars made from oil cans or cigar boxes and the like, so Traveler is in good company. However, the compromise in both playing feel and sound may be just too much for all but the most dedicated practising player (who is faced with draconian carry-on rules or lack of car space thanks to the kids’ paraphernalia when you set off on your hols). If you need small - but not in-scale length, fret complement or neck feel - Traveler Guitar certainly has a big and diverse range of electrics, electros and even acoustics with which to tempt you. And, c’mon, if you turn up at your local blues jam toting a Travelcaster you’re going to be noticed. What would Leo have said?